A year ago, just after the title essay in Jonathan Franzen’s new collection was first published in the New Yorker, I attended “a night of storytelling” that Franzen headlined in New York. He spoke about something that happened when he was in the fifth grade. He and a new kid in school, named Chris Toczko, both wanted to win their class’s “Homonym Spelldown.” When Franzen appeared victorious, Chris Toczko had a bit of a meltdown. Both ended up in the principal’s office. A few weeks later, Chris Toczko was hit a by a car and killed. Franzen first related this story in “The Comfort Zone,” an essay mostly about Franzen’s brother Tom and the cartoonist Charles Schulz. That piece was published in the New Yorker in 2004. (It was reprinted in The Discomfort Zone under the title “Two Ponies.”) At the storytelling event, Franzen described how, before the essay could be published, a New Yorker fact-checker had to call up Chris Toczko’s mother so she could confirm a few details. Several weeks later, Franzen received a long letter from Mrs. Toczko. He was so frightened by the letter that he asked his girlfriend to read it for him and describe what it said. By this point in Franzen’s story I was no longer thinking of Chris Toczko. I was thinking of David Foster Wallace. The essay Franzen had published two weeks earlier was about Wallace, who had committed suicide two and a half years before. And that essay, called “Farther Away,” was also about “taking control of a story”: In it, Franzen attempts to correct the “adulatory public narratives” of Wallace and his death. 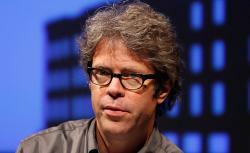 When it comes to Wallace, Franzen is, in some respects, in Mrs. Toczko’s position. He was personally close to him, while most of us fans and readers who have written and spoken about Wallace since his death were not. (At the beginning of “Farther Away,” Wallace’s wife, Karen Green, gives Franzen some of Wallace’s ashes to scatter on the island he is headed to on vacation.) But he was also competitive with Wallace—their friendship, he acknowledges in the essay, was one “of compare and contrast and (in a brotherly way) compete.” (Another reason I was thinking about Wallace: Both “Farther Away” and the Chris Toczko story are about a rival who died.) And beyond simply refuting “the benignant and morally clairvoyant artist/saint” image that arose around Wallace after his death, Franzen insinuates fairly terrible things about his friend, without explaining those insinuations to his readers. For instance: “I will pass over the question of diagnosis (it’s possible he was not simply depressive) and the question of how such a beautiful human being had come by such vividly intimate knowledge of the thoughts of hideous men.” Of course, Franzen hasn’t really passed over the question of diagnosis; he has explicitly raised it, while also implying that Wallace had to have been like the “hideous men” in his fiction (as though he were incapable of otherwise imagining such hideousness). Elsewhere, Franzen says Wallace’s suicide was “calculated to inflict maximum pain on those he loved most.” More than once, Franzen suggests that Wallace had deliberately gone “the Kurt Cobain route” and “chosen the adulation of strangers over the love of the people closest to him.” He says that “infantile rage and displaced homicidal impulses [were] visible in certain particulars of his death.” What those “certain particulars” were, Franzen doesn’t say. And I don’t personally feel any deep need to know what they were. But if you are going to make, in print, what is essentially an accusation, you should, I think, provide some evidence for it. (To be honest, I wonder why no editor at the New Yorker insisted as much.) Otherwise, you are not only seizing control of the story, you’re keeping much of that story for yourself. I was just doing what a writer does, right? I was telling a story, trying to make sense of my life, and passing it along in hopes that it might resonate with other people, and, you know, there’s sort of an exchange of gifts going on here. And it’s my job to give gifts like that. And yet in that envelope was somebody’s painful report on the price of seizing control of the story. Perhaps Franzen intended “Farther Away” as a similar report. Perhaps he felt that “those who read [Wallace’s] Kenyon College commencement address in the Wall Street Journal and mourned the loss of a great and gentle soul” had unfairly seized the story of his friend. And because there were so many such people, he could not simply write a letter, as Mrs. Toczko had done, but instead had to write an essay for the New Yorker, one that was published the same week as The Pale King, Wallace’s last, unfinished novel. But reading that essay again, between the hard covers of Franzen’s own latest book, it does not feel like a gift.